What type of drum lessons to you offer? Drum set is a very popular instrument. At our Sherman Oaks studio, we offer drum lessons for kids, teens, and adults. You will find our studio to be a clean, state of the art music lessons studio. Our drum teachers are university trained working music professionals that love to teach. Because of this they are well versed in teaching proper drum set technique in all styles including rock, jazz, blues, funk, swing and more. Private lessons are offered in 30 minute, 45 minute, or 1-hour classes. What is a good starting age for drum lessons? We have seen kids as young as five years old start drum lessons. However, we do take this case by case and will gladly discuss what would be best for your child. We can even schedule a trial lesson to determine if your child is ready for lessons. Lessons are taught on a drum kit at our Sherman Oaks studio. Students can however, get started practicing at home on practice pads before purchasing a drum set. We can guide you in deciding on the right drum set for your lessons. Do you teach drum lessons for teens and adults? Yes, we offer drum lessons for teens and adults at our Sherman Oaks studio. Whether you are playing rock n roll, blues, jazz, heavy metal and more we have the right teachers for you. If you are starting lessons for the first time or you just need to hone your skills, our qualified staff of university trained teachers can customize a lesson plan just for you. 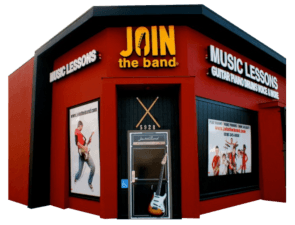 Join the Band is located at 5928 Van Nuys Blvd, in the Sherman Oaks community of Los Angeles. One of our drum students (Johnny) was featured playing drums in a national commercial. Special thanks to all of the Join the Band drum teachers that prepared him for this opportunity! Call To Start Drum Lesson Today! Take drum lessons with experienced university trained teachers. Find a music school that caters drum lessons to meet your needs. Choose a music program with experienced music teachers. Ask if the music school offers yearly recitals.